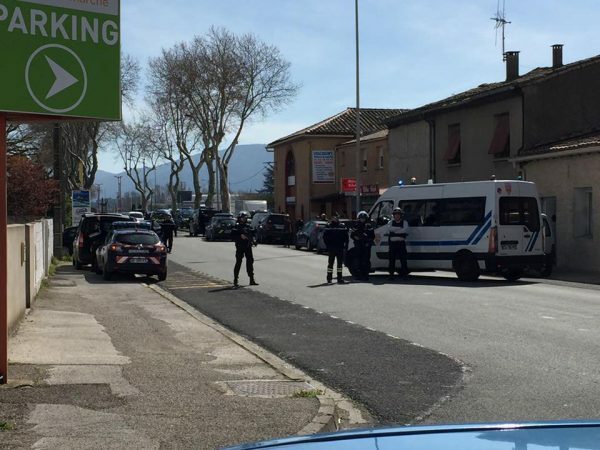 TREBES, France—Three people were killed in southwestern France on Friday March 23 when a gunman held up a car, opened fire on police and then took hostages in a supermarket, screaming “Allahu Akbar”. 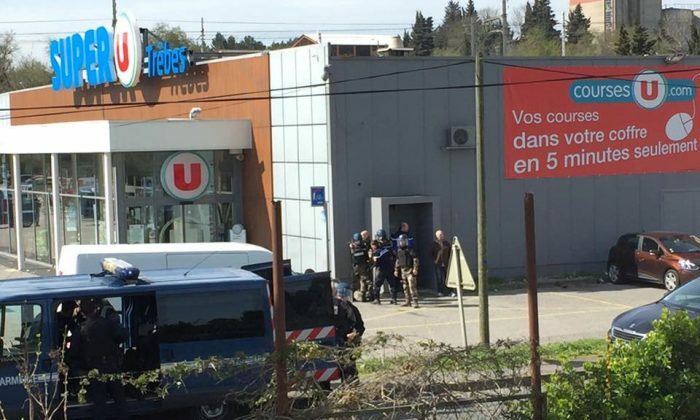 Police later stormed the supermarket in the small town of Trèbes and Interior Minister Gerard Collomb said on Twitter that the attacker had been killed. A source at the Interior Ministry said two had died at the hostage-taking in Trèbes. “It is a provisional assessment as it could unfortunately get worse. Three people are wounded, including one of them seriously,” the source said. Eric Menassi, the mayor of Trèbes, told BFM TV that the hostage-taker was now alone with one police officer in the supermarket and all other hostages were free. The station reported that the hostage-taker has claimed allegiance to Islamic State and that he has demanded the release of Salah Abdeslam—the prime surviving suspect in the Islamic State attacks that killed 130 people in Paris in 2015. More than 240 people have been killed in France in attacks since 2015 by assailants who pledged allegiance to, or were inspired by, Islamic State. First the gunman held up a car, killing one person and wounding another. Then he fired one police officers in Carcassone, wounding an officer in the shoulder before heading to Trèbes about 8 km (5 miles) to the east, where two more died in the Super-U supermarket. Menassi also told LCI TV that the man had entered the shop in Trèbes screaming “Allahu Akbar, (God is greatest) I’ll kill you all”. Carole, who was shopping at the supermarket, described how people had taken refuge in a cold room. French investigators believe they have identified the hostage-taker. The man is known to the intelligence services and flagged in a database of radicalized Islamist militants, Franceinfo reported. Police in helmets and body armor took up positions around the Super-U supermarket. The Paris prosecutor’s office said counter-terrorism prosecutors were investigating the incident but did not comment on the possible Islamic State allegiance. Earlier, the Interior Ministry had said security forces were carrying out an operation at a supermarket in southern France. Interior Minister Gerard Collomb was on his way. The UNSA police union also said on Twitter a police operation was underway after an individual had earlier shot at four officers in the Carcassone region, wounding one of them.